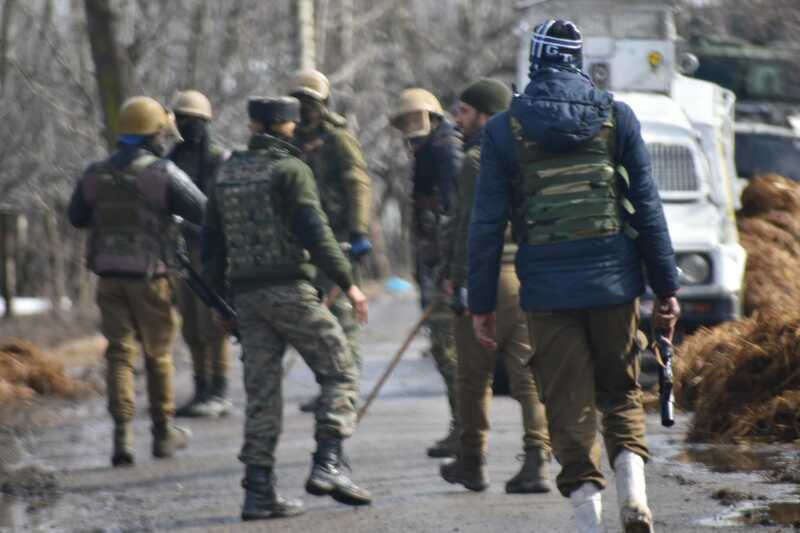 Sopore, March 04 : Braving incessant rains thousands of people including women on Monday morning attended the funeral prayers of slain Lashkar-e-Toiba North Kashmir militant at his native village Brath. Ishfaq Ahmed along with foreigner militant Kalimullah were killed in a three day long gunfight in Babagund area of Handwara. An eyewitness said that thousands of people braving rains assembled in Brath village of Sopore to take part in the last rites of slian. A large number of mourners shouted pro-freedom slogans while carrying militant body in a procession to the martyrs’ graveyard for burial, reports added. Earlier authorities have suspended the Internet service in parts of Sopore as a precautionary measure. Meanwhile parts of Sopore shuts to mourn the Killing of two Lashker-e-Toiba militants. Pertainally, in the 50 hour long gunfight five security forces personnel including an Inspector also killed and eleven others were injured. In this three day-long gunfight a civilian also was allegedly killed in government forces action amid clashes near the gunfight site on second day of Friday evening. This Encounter ended up with the heavy loss to many families whose houses have been razed to rubble, while two cowsheds and a tin shed also damaged during the course of gunfight.